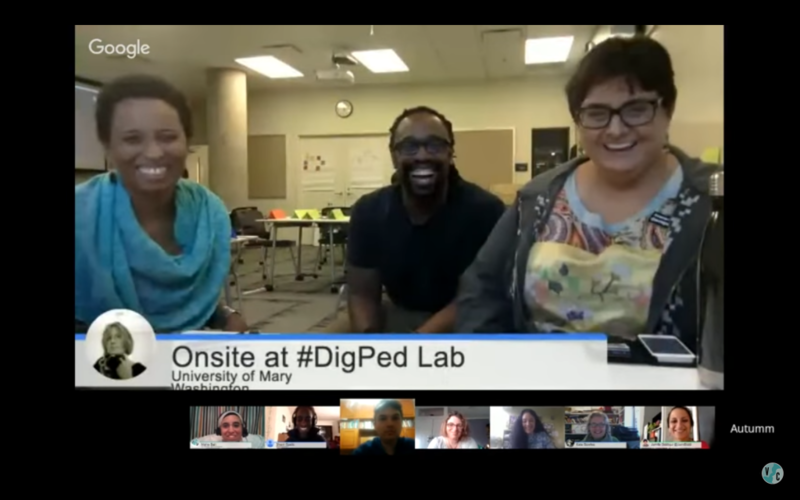 I’ve enjoyed being a part of Virtually Connecting, which is a group that uses technology to connect academic conferences to off-site “participants” who might not otherwise have a way to engage with the academic content and relationships from the events. There are many things I love about VConnecting, but one is the way it has developed the idea of the “hallway conversation.” After a panel or keynote, VConnecting will set up a no-fuss connection using a laptop or sometimes even a cell phone to capture reactions from on-site attendees and speakers, and to allow off-site folks to ask questions and engage. The hallway conversation obviously contributes to making academia more accessible, but I think equally important is the way that it rethinks the spatial in-between. These in-between spaces are often considered “dead spaces” when we design learning environments, but perhaps we’re not thinking creatively enough about their potential. the connective tissue that constructs the difference between upper and lower, black and white. The hither and thither of the stairwell, the temporal movement and passage that it allows, prevents identities at either end of it from settling into primordial polarities. In-between spaces are not spaces where content lives. They are spaces where conversations happen. For something to be “in between,” it has to be coming or going, or at least be in relationship to the things on either side. These in-between spaces are borderlands, always dynamic because they are relational. What would happen if we thought about classrooms, or online courses, as liminal or in-between spaces rather than as destinations or locations? I think about the difference between a VConnecting session and a keynote. The keynote is like a traditional classroom: information is broadcast and, even when it’s inspiring and well-crafted, usually happens more in monologue than dialogue. But the VConnecting session is more like an in-between space. There is no linear agenda, just the goal of sharing, questioning, reflecting, and connecting. Clearly, learning can happen in both spaces. But what kind of learning? What the hallway offers is relational energy. And relational energy is necessary for learning to keep happening. This is one problem with keynotes. And as a frequent keynoter, I lament it all the time. People can get all fired up by stuff I share, but when I leave, what structures are left in place for uptake, for continued development? Sometimes folks find their way into post-keynote follow-up, but it’s because of their own industriousness, not generally because the keynote has set up a structure to keep generating learning and contributions to knowledge. This is the same with courses. Sometimes students keep learning past the bounds of our courses, but that’s often because they transcend the expectations of a course’s own finite structure. What would happen if we built courses that, like stairways, were always in motion, always in dialogue with content rather than broadcasting content? What would a classroom look like if it were set up for dialogue rather than monologue? What would a syllabus look like if it’s goal was to connect things rather than to arrive somewhere? Will we know learning is happening if we don’t measure it by where it ends?